Mich Matsudaira, far right, in front of Mich’s Men’s Shop. Courtesy photo. Martin “Mich” Matsudaira, longtime community leader and founding executive director of the Washington State Commission on Asian American Affairs will be remembered on Saturday, April 27 at 11 AM at the Immaculate Conception Church in Seattle. Matsudaira, who passed away on March 24, was born on November 12, 1937 to Thomas and Theresa Matsudaira. He was one of 14 siblings. His family was incarcerated in Minidoka, Idaho during World War II. Mich’s older brother was artist John Matsudaira, a member of the celebrated “Northwest School,” which included George Tsutakawa, Kenneth Callahan and Paul Horiuchi. Mich and other Asian American activists helped establish the Governor’s Asian American Advisory Council in 1972. Two years later, the Council became the Commission on Asian American Affairs, an Olympia-based state agency now known as the Commission on Asian Pacific American Affairs (CAPAA). Mich served as Commission director until 1978, when he resigned in protest against newly-elected Governor Dixy Lee Ray, whom he publicly accused of neglecting and undermining the agency. “Mich understood the power of collective action and advocacy, and helped institutionalize a seat at the Governor’s table for our diverse communities,” said CAPAA executive director Toshiko Hasegawa. CAPAA will celebrate its 45th anniversary on April 13 at Eden Seattle. Mich was a longtime member of the Seattle Chapter of the Japanese American Citizens League, serving as President in 1974. In the 1970s, he also volunteered with the Campaign for Human Development, the national anti-poverty program of the U.S. Conference of Catholic Bishops. 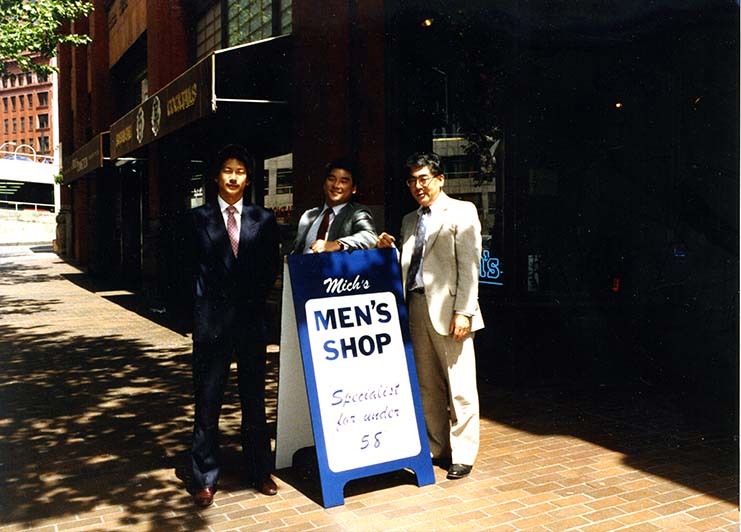 Matsudaira, employed as an industrial engineer and manager for the Boeing Company before joining the Commission, later opened Mich’s Men’s Shop in 1978 in the International District at 662 South Jackson Street. At the time, department stores and clothiers did not carry formal attire suitable for shorter adults. The store later moved to Belltown, then to Pioneer Square. Matsudaira returned to Boeing to work on labor forecasting before finally retiring. In his final years, Mark said, his dad became hard of hearing, and began wearing headphones so he could listen to the news and Japanese Taiga dramas on TV. “Sometimes he would talk to you, but he forgot he was wearing headphones, so he couldn’t hear anything you were saying,” Mark said. Matsudaira is survived by his four children Mark, David, Melissa and Scott, nine grandchildren and one great-grandchild. The family has asked that in lieu of flowers, donations be made to the Nisei Veterans Committee.